Add a frugal tip right here. And enter my giveaway. 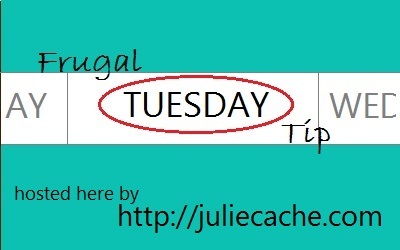 The Frugal Tuesday Tip is the time of the week when my hostesses and I share our frugal tips with you and ask you to participate, too. Anything done frugally can be included — food, crafts, clothing shopping, almost everything can be done for less. Adding your blog post to the linky. Your one post will show up on the four hostess websites! Make sure your post was published within the last seven days. Our linky is open until Friday night. AND, I’m having a GIVEAWAY! In fact, all four of us hostesses will be giving away something to celebrate the Frugal Tuesday Tip’s one year anniversary. I haven’t decided on what I’m going to give away, but I will know by next week’s Frugal Tuesday Tip. So come back!